▷Size: 31cm x 21.5cm X 7cm (Around A4) ▷Material: White paper card with matte coating. Comes with gold ribbon. **Additional shipping fee will not be charged for purchasing more than one paper bags (and purchasing paper bags only in the whole order). Please contact us to deduct the additional shipping fee before ordering. Thank you! "Bruni and Gumby's Afternoon Tea" is a handmaking brand featuring the cute French bulldogs Bruni and Gumby. Let's see how they enjoy their afternoons! 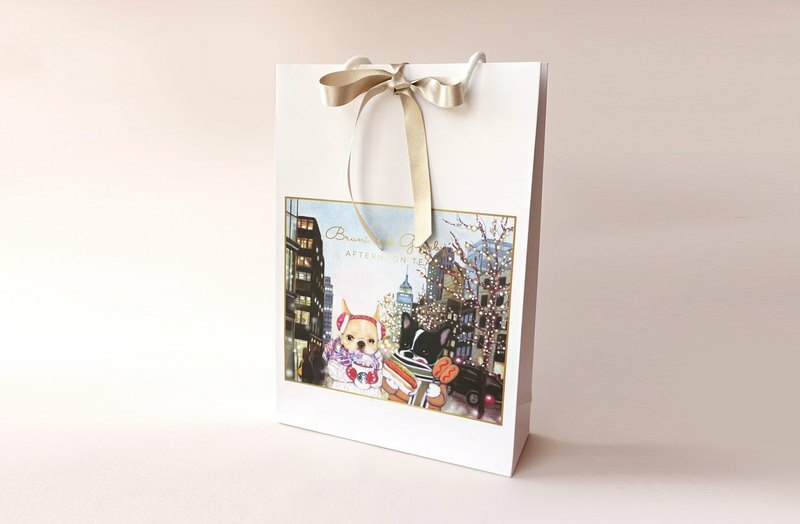 Send your warm greetings and blessings with this specially illustrated Christmas edition gift bag. Walking along the streets of New York City, French bulldogs Bruni and Gumby are having hot dogs and hot chocolate by the beautiful light-up trees. Simply happy!